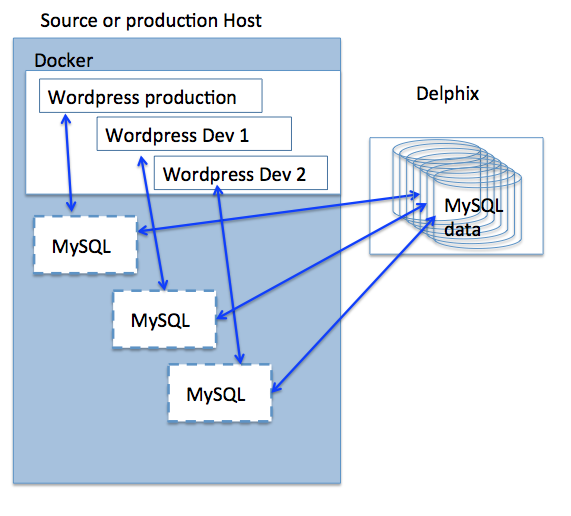 In my last post I showed using Docker and Delphix to support WordPress. I use wordpress for this blog. Works fine on it’s own. It is just me making a few posts here and there. Occasionally there are problems like an upgrade that goes bad or a hack that get’s some redirection code into the site. 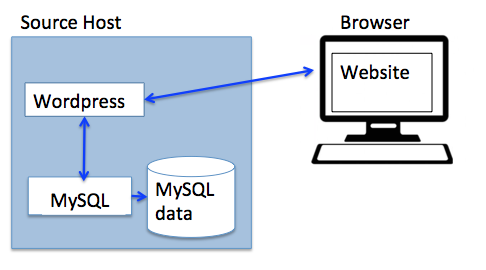 In those cases I have to go to a backup of my MySQL database that is used by wordpress on my site. The database is small so it’s pretty quick to backup, but I don’t back it up normally. I know I should and occasionally it would be nice to have a backup in the event that data is corrupted somehow (like hacks into the contents of the database). 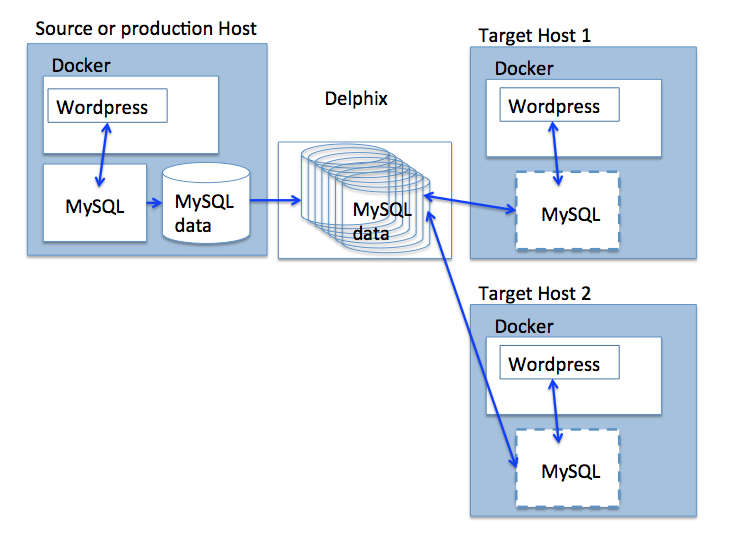 WordPress uses MySQL for the data store and the wordpress content changes are all stored in MySQL. 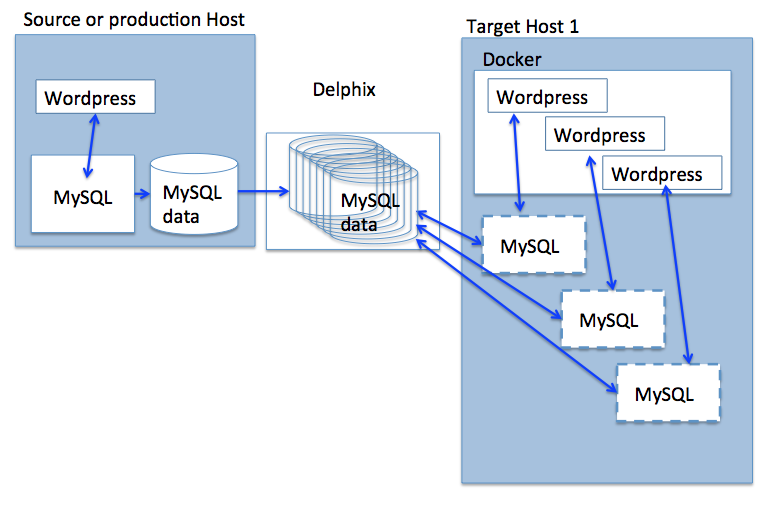 MySQL data can be linked to Delphix which automate data management for MySQL (or any data) by providing backups, versioning and fast thin cloning of the data to be used in development and QA. One weakness of this architecture is any changes to the wordpress website are being made on the source. Why is that a problem? It’s a problem if something goes wrong when deploying changes. How do you rollback any incorrect changes? What happens if multiple developers are working on the wordpress site? Is there any way to version changes to keep changes by one developer separate from another? I just use wordpress for my personal blog but what if you used it for your business and what if multiple people were making changes. In this case, ideally I want to make changes on a staging site and when changes are validated then push them to the production site. Ideally development on the wordpress site is done on a staging or development server. Backups down to the second of production for a multiple weeks generally stored in less than the size of the original database thanks to compression and deduplication and accessible in a matter of minutes. Thin clones of the data providing as many copies to as many developers as we want for almost free. Point 1, backups, is a huge piece of mind. Once Delphix is connected to the production/source database then backup is automatic and recovery is a no stress few clicks of the mouse. Docker containers are self contained and don’t impact each other (except potentially on a resource consumption level like CPU). 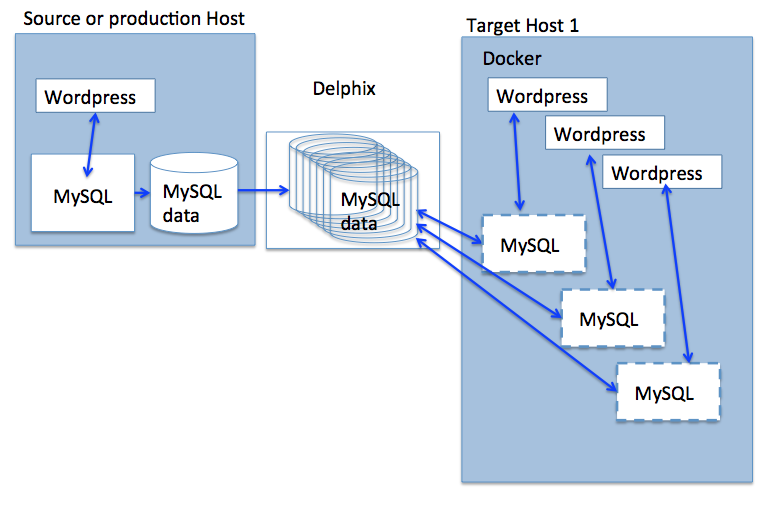 In this case, our production MySQL database is using data directly off of Delphix. This allows us to quickly rollback any changes by simply using Delphix to rollback to an earlier version of the database. Or we could promote a developer copy directly to production. 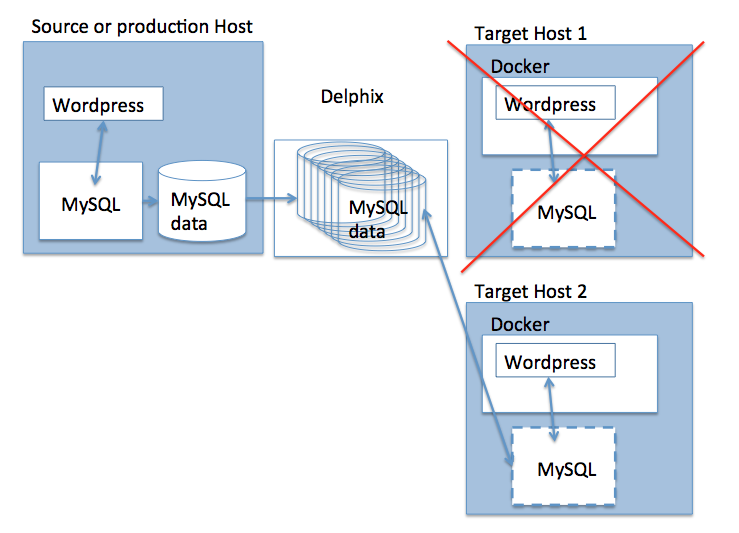 And if the host went down, we could fail over to another machine quickly by starting up a docker wordpress container there and provisioning it with a thin clone in minutes from Delphix. Great stuff. I wonder if WordPress hosts like WordPress.com and many others should use this as part of their service.